Every issue of Imbibe is a celebration of what we love about the world of drinks. But once a year, we like to get especially sentimental and dedicate an entire issue to highlighting a select group of people, places and flavors that we’re most excited to watch in the year ahead. We call it the Imbibe 75. 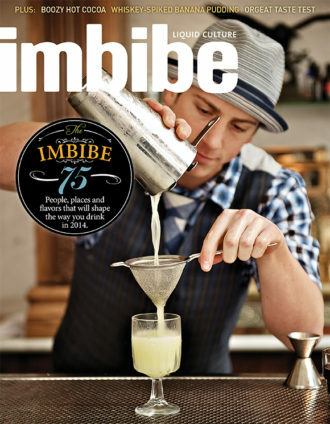 Last year, our inaugural Imbibe 75 Issue featured the likes of Kansas City’s Ryan Maybee as our Bartender of the Year, Alice Feiring as our Wine Person of the Year and Pouring Ribbons as our Cocktail Bar of the Year. There’s no magic formula, no competition, and the choices often seem daunting. But we like to think of this as an opportunity to take stock of what’s been happening in our world over the past year, who’s had a notable impact and who looks to have an intriguing vision for the future. This year, our list travels around the world, with destinations in Australia and Mexico, our Cocktail Bar of the Year in San Diego and Bartender(s) of the Year in Houston, our Beer Person of the Year in Washington, D.C., and our Coffee Person of the Year in Portland, Oregon, to name a few. Each person and place on the list shines in a unique way, whether it’s our Wine Person of the Year, Patrick Cappiello, who’s become one of the most compelling (and energetic) voices in wine, or our Cocktail Bar of the Year, San Diego’s Polite Provisions, which has combined the talent of bartending powerhouse Erick Castro with the timeless concept of quality and hospitality in a city that’s quickly becoming a world-class cocktail destination. There’s a lot to explore in the pages ahead, and we hope you’ll use this issue as inspiration for your own travels throughout the drinkscape—after all, you’ve got 75 reasons to start now.